Made from Gewurztraminer, which is a white grape from Germany that’s super aromatic (crazy lychee), low in acid, and even a little sweet. The Garnacha grape is low in acid in tannin, and high in berry flavors and sugar. It’s usually blended with Tempranillo in Spain, and with Syrah And Mourvedre in France (where it’s called Grenache) to make Chateauneuf du Pape (regal link)! This one would be made from Gruner Veltliner, a light white grape from Austria usually drunk on the younger side. It often has some white pepper and grass notes plus a little fizziness – very refreshing. Since we’re a democracy here in America, what’s your vote? 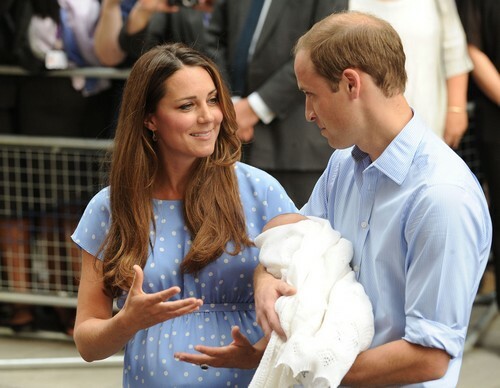 Tags: ale, beer, garnacha, gewurztraminer, Grenache, gruner veltliner, kate middleton, royal baby, wine. Bookmark the permalink. What a fancy prince! I’m liking the Chateauneuf du Pape in honor of the tiny royal! I agree – though Georger Veltliner makes me laugh every time!